In 1863, the General Assembly of New Zealand in Parliament enacted The Nelson Waste Lands Act, 1863, repealing The Nelson Waste Lands Regulations Amendment Act, 1861, and the Schedule to the Waste Lands Act, 1858, so far as regards the Nelson Waste Lands Bill, 1858. The Act established a Waste Lands Board consisting of the Superintendent, the Commissioner and the Speaker of the Provincial Council, any two of whom could constitute a quorum. The Board had the power to create reserves for gold districts, roads, railways, canals, drains, gravel pits, quarries, quays, docks, landings, the improvement of rivers and watercourses, schools, libraries, hospitals, charitable institutions, scientific institutions, mechanics institutes, markets, court houses, prisons, cemeteries, parks, other public edifices and “any purpose of public profit advantage utility convenience or enjoyment.” The Board also had powers to sell Waste Land and to purchase land not open for sale and pay compensation for any existing improvements on that land. It could also lease unused land to licensees for prospecting, mining and grazing stock. The New Zealand Government Gazette (Province of Nelson) of 16 September, 1865, gave notice that, under the Nelson Waste Land Act, 1863, unused Crown Land was reserved for the purposes of the Nelson Waterworks, being “all the Crown Land included within the watershed of the gorges of the Brook-street stream and tributaries; bounded on the south-ward by the ridges of the hills forming the said watershed, and on all other sides by the sold lands”. The sold land to the west of the Reserve was owned by Alfred George Jenkins and is still known as Jenkins Hill. Jenkins had also owned the sold land to the east, but in 1861 sold the Dun Mountain Copper Mining Company the portion along and above the Company’s railway line. On 12 August 1879, when the Nelson Provincial Government was dissolved and the Borough of Nelson created, the Crown, by Order in Council under The Public Reserves Act Amendment Act, 1878, vested the ownership of the Waterworks Reserve in “the Mayor, Councillors and Burgesses of the said Borough of Nelson, in trust for the purposes aforenamed.” The Reserve comprises 1,416 acres (573 hectares) and occupies all of Section 14 of Nelson South. It is shown in early Waimea County Council maps of the Maungatapu and Waimea Districts (M919 and M920). The western boundary with Section 30 appears to more or less follow the current firebreak up Jenkins Hill and the southern boundary is the ridge that proceeds east from Jenkins Hill around the top of the valley. On the eastern side, the Dun Mountain Railway forms the boundary, passing through, from south to north, Sections 27, 19 and 20, which all form part of the Brook Dam catchment. Current land parcel boundaries suggest that the northern boundary of the Waterworks Reserve crossed the valley between the upper dam and the later Big Dam. There are several parcels currently owned by Nelson City Council to the north of this, taking in both sides of the stream to the Jenkins Hill ridge and above the Dun Mountain railway line, the Brook Motor Camp area, sections on the western side of the stream opposite the Camp, and the legal road through the Camp to the Big Dam and further up the stream. A deed dated 17 June, 1895, in which Alexander O’Brien sold the Nelson City Council a parcel of 23 acres and 3 roods north of the Waterworks reserve, bounded in part by Section 22. There was no map of the parcel in the deed. A deed dated 6 May, 1905, in which Alexander O’Brien sold the Nelson City Council a parcel of 10 acres, 2 roods and 35 perches which makes up, more or less, the western side of the Brook Stream from just below the old, upper dam, through the Big Dam and the Brook Camp. The land was originally part of a Crown Grant to Alfred George Jenkins on 15 October, 1851. It was conveyed to Richard Webb Jenkins on 10 May 1894 and to Alexander O’Brien on 1 November 1894. It was then leased to R.W. Jenkins for the Enner Glynn Coal Mining Company, which drove two mines near the Waterworks reserve on the western side of the Brook Stream. The lease was surrendered on 20 May, 1902. In 1856, the Nelson Provincial Government enacted the Nelson Improvement Act to establish a Board of Works with powers to construct and maintain, among other things, “wells, tanks, reservoirs, aqueducts and other waterworks as they shall think proper for supplying the inhabitants of the town with water”. An amendment to the Act in 1858 gave the Board powers to borrow money for projects including “supplying the inhabitants with pure water”. In 1863, the Nelson Provincial Council enacted the Nelson Waterworks Act to “make provision for the making and maintaining Waterworks for supplying the City of Nelson with Water … from the Brook Street Valley”. On 9 May 1865, the Nelson Examiner published a report by the Provincial Engineer, in which he outlined his proposal for the Nelson Waterworks to be constructed in the upper Brook Valley. The report refers a reservoir that was to be supplied from a dam that was to be constructed in the Brook Stream. The reservoir, as well as storing a supply of water, had the additional purpose of letting silt settle before the water was piped down to the town. The proposed reservoir, which was referred to as being about 300 feet (91m) higher than the town, would “contain a supply equivalent to forty days’ consumption at the rate of 40,000 gallons (182m³) per day.” Altimeter readings indicate that the reservoir is 88m (289 feet) above sea level. When the Waterworks eventually went ahead, it included a dam about 42 feet (13m) higher in altitude (101m/331ft above sea level) than the reservoir, with a 12 inch (30cm) cast iron pipe down to the reservoir, 7 inch (18cm) pipes from there to the town and a road to the reservoir. The entire project was designed and overseen by Mr. John Blackett, the Provincial Engineer. On 13 April, 1868, Blackett reported that the works had been completed, that the dam had been filled several times and full pressure had been laid on in the pipes. Although costing £300 less than the budget of £20,000, the project had taken around two years longer than expected. The Waterworks were officially opened on 16 April, 1868. The opening was declared a public holiday and was celebrated by a procession to the reservoir and back to the Government Buildings in Bridge Street, where a speech was made by the Superintendent of Nelson, Mr. Oswald Curtis. Bishop Suter composed a prayer and a hymn for the occasion, both of which were printed in the following edition of the The Nelson Examiner. There is some conflicting information regarding the reservoir’s initial location and date of construction. The Nelson Examiner on 18 April, 1868, states that it stood “on a piece of table land about a quarter of a mile lower down the valley and thirty-four feet below it in level. Altimeter readings indicate that the upper rim of the Circular Basin is about 12m (39ft) below the top level of the old dam. However, a notice board beside the bridge that crosses the Brook Stream below the 1904 Big Dam states that the original reservoir was located in the stream above the Big Dam and that it was “shattered” by an earthquake shortly after its construction. The notice board, and a pamphlet available from the Nelson City Council, state that the Circular Basin in the Brook Camp was built in 1874 to replace the original, earthquake-shattered reservoir. In the Journal of the Nelson and Marlborough Historical Society, Volume 1, No. 3 of November 1983, J.N.W. Newport reported that A.D. Dodson, in his reminiscences, stated that the reservoir was shattered by an earthquake soon after it was built, and that from then water was piped directly from the dam above it. From its original construction, the dam could supply water directly to the mains or via the reservoir. There was a significant earthquake in Nelson on 19 October, 1868, and in his annual report of 4 May, 1869, the Provincial Engineer informed the Provincial Council that the earthquake had damaged the reservoir enough to “increase the small amount of leakage which had previously occurred. To remedy this …(I) had the whole of the inner surface of the walls well pointed and faced with cement. This was attended to with good results, and the new works appear to stand well.” It would appear then, that the reservoir was not “shattered” in the earthquake and was easily repaired. There is no mention of any further Waterworks construction in the Government Gazette (Nelson Province) through to 1875, although its on-going operating expenses are reported. It would appear, then, that the Circular Basin on the table land in the Brook Camp was the original reservoir, that the notice board reference to a reservoir in the stream is erroneous and that there was no second reservoir constructed in 1874. The eventual form of the Circular Basin reservoir was an oval, in-ground tank that could hold 775,000 gallons (3,523m³) - around two weeks supply for the City at the time. This is about half the size originally proposed by the Provincial Engineer, which was to hold 1.6 million gallons (7273m³). The supply dam, often referred to a “stone weir”, presumably because its construction using large stones cemented into a dam, is still largely intact although severely undercut by flood waters over many years. On the eastern side of the stream below the dam there is evidence of a pipeline that passes through a concrete, well-like construction some distance below the dam. The 18 April, 1868, description of the Waterworks published in The Nelson Examiner states that “the water, before entering the pipe, whether for direct service to the town or to supply the reservoir, passes through a well in which is placed a wire strainer, so that all foreign substances are kept back.” The same report stated that the dam was 340 feet (104m) above high water sea level. Altimeter readings indicate that it is 101m (331ft) above sea high water sea level. By 1900, the building of houses on the higher slopes around the town had rendered the water supply system inadequate. Residents complained of going without water at times, especially during the high demand period during the evenings. A supplement to the Nelson Evening Mail on 6 December 1900 printed a report by Mr. R.L. Mestayer of Wellington, a consultant engineer, regarding the options for a new water supply scheme for the City. The report, dated 13 October, 1900, describes a small dam with water holding capacity for approximately one third of a day, and a concrete tank that could hold water sufficient for approximately one day. There was a twelve inch (30cm) main connecting the dam valve tower to the concrete tank and a seven inch (18cm) main from there to the city. The system was theoretically capable of delivering 700,000 gallons (3,182m³) of water per day to Nelson’s population of approximately 7,000 people. Mr. Mestayer, in allowing for sediment and other deterioration, estimated that the system was probably capable of delivering 650,000 gallons (2,955m³) per day. The report examined the option of a dam at the Maitai River branches, close to the site of the present Maitai Dam, but concluded that such a project would be expensive and was unnecessary given that a suitable supply could be obtained by building a new, larger dam in the Brook Valley. Four sites in the upper Brook Valley were considered, but the best was believed to be the site that was eventually chosen, reported as being 358 feet (117m) above sea level and 330 feet (101m) above the flat part of town. It was estimated that a dam fifty feet high at that location could hold 40 million gallons (181,843m³). This would be enough to provide 650,000 gallons (2,955m³) per day for 120 days, even during a severe drought such as the City had experienced in 1895. The report also proposed that the main to the town be upgraded to eight inches (20cm). By 1908 the dam had developed serious leaks and on 12 February, 1908, The Colonist reported that it had been emptied for repairs and the old, higher dam had been cleared of debris so that it could once again provide the town’s water supply. The concrete for the Big Dam had been hand mixed, using crushed rock from the stream and a nearby quarry, and contained many voids that led to the leakage. The dam remained empty until 1911, by which time the inner face had been re-mortared at a cost of £2,418. Unfortunately, it continued to leak, although not as badly as earlier. By March 1909, a weir had been constructed 150 feet (46m) (an altimeter used on 9 June 2006 indicated 161 feet/49m) above the Big Dam at a cost of around £2,000. The weir, which is commonly referred to as the Top Dam, was describes as 71 feet (22m) wide and 39 feet (12m) high. The water was 23 feet (7m) deep at the weir and 12 feet (3.7m) deep at the top end, which was five and a half chains (110m) upstream. The weir provided a reservoir of 4 million gallons (18,184m³). Water was delivered via an eight inch (20cm) asbestos pipe and the added altitude enabled water to be delivered to higher levels in the town. The weir filled with debris during the 1970 floods, rendering it unusable for water storage. The riveted spiral iron pipe that can be seen for about 100m upstream is described in the Nelson City Council notice board near the Big Dam as being an additional source of supply. It may also be a diversion pipe that was used during the construction of the weir/dam. The Nelson Evening Mail of 25 August, 1938, mentions that Cummins Creek, which is the first tributary into the Brook Stream below the Brook Camp, was also brought into the system at some ‘later’ time and provided an additional 80,000 gallons per day. During the 1920s the water supply from the Brook Dam was proving inadequate and bores were sunk at the cemetery and near Normanby Bridge in Bridge Street near the Queen’s Gardens to provide additional supply. In 1922, a £20,000 loan provided for new water mains from the Brook Dam, which increased the dam’s output fourfold but emptied it four times as rapidly. On 27 July, 1934, the Nelson Evening Mail reported the Brook scheme’s delivery capacity at 682,000 gallons (3,100m³) per day. On 29 January, 1937, the Nelson Evening Mail reported that the Brook Dam could supply 600,000 gallons per day and the weir could supply 500,000 gallons (2,273m³) per day. At the time, an additional 200,000 gallons (910m³) per day were obtained from a pumping station in Hanby Park, although there were concerns about the quality of the water taken from the Maitai River at this point. Again, residents were complaining of poor supply and it was asserted that larger mains were required to deliver more water from the Brook Dam. Agriculture and industry in the town used considerable quantities of water, with one unspecified industry absorbing up to 100,000 gallons (455m³) per day. The Roding River water supply scheme was chosen as the next water source and was completed in 1941. On 2 April, 1947, the Nelson Evening Mail reported that the Brook scheme was capable of 700,000 gallons (3,182m³) per day, of which 500,000 gallons (2,273m³) could be delivered in twelve hours. At this time, the combined output of the Roding and Brook schemes averaged 15% overcapacity for the water requirements of Nelson, Stoke and Richmond. As a further source of water for the rapidly growing City, the Maitai South Branch project was completed in 1963, by which time that supply and the Roding scheme provided three quarters of Nelson’s water. 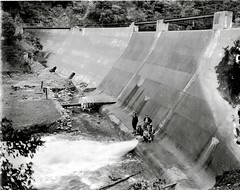 Because of safety concerns the level of the Brook Dam was lowered by 2 metres in 1964 and the 1970 floods filled the weir with debris, rendering it unusable for water storage. The Brook Dam was lowered a further 3 metres in 1980 and the completion of the Maitai Dam in 1987 rendered it obsolete. In 2000, it was totally decommissioned by a further lowering of its level. The Dun Mountain Railway line forms the eastern boundary of the Brook Wildlife Sanctuary from Third House down to above the Big Dam. The history of the Dun Mountain Copper Mining Company and its railway are well documented, but a brief summary seems to be in order given its prominent history in the Brook Valley and the railway line’s location on the boundary of the Sanctuary. In 1854, capital was raised in England to improve access to the mineral belt via the Maitai Valley. In 1856, 16 tons of high quality copper ores and 15 tons of chrome ore were brought out. In 1857, the Dun Mountain Copper Mining Company was registered in London, with capital of £75,000. In 1858, materials for the railway line from the Brook Valley began to arrive in Nelson, although construction was delayed due to the extent of the copper deposits being questioned. 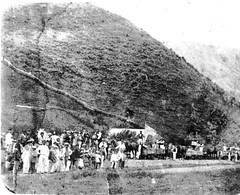 The extraction of chromite, which was used for dyeing cotton yellow and mauve, continued by pack-horse via the Maitai Valley, although it proved to be an expensive method. In 1860, the price of chromite rose significantly and the decision to build the railway was taken. Construction of the 13.5 mile (21.7km), three-foot gauge line began in March 1861. It proceeded up the Brook Valley, crossed the Third House Saddle (also known as Wairoa Saddle) to the Roding Valley and continued around Wooded Peak to Coppermine Saddle. It was New Zealand’s first railway. Horses pulled the wagons up the line, which varied in gradient between 1:76 and 1:20. The full wagons travelled down, under gravity, in pairs, with brakes to slow their descent. There were seven houses along the line, with stables at Third House. The extent of the chromite deposits was considerably overestimated and only 3,910 tons were extracted in the first year although the railway had been constructed with the capacity to deliver 10,000 tons per year. The company had largely ceased operations by 1863, although further small quantities of largely low-grade ore were extracted in 1865, bringing the total of chromite ore extracted to a mere 5,666 tons. The company used the railway to deliver firewood, timber, slate and limestone to Nelson, and operated a passenger omnibus service from the Brook Valley, through the town to the port. However, its affairs were wound up in 1872 and on 18 May, 1872, the Nelson Examiner reported the sale of all of the company’s equipment and property, which included the houses along the line, an eleven-roomed house in Nelson, 45 wagons and the passenger omnibus that was rented for £3/10 per week, for £4,750. The passenger service continued for many years, including excursions to the mines. The lines through the town were pulled up in 1907. There was coal mining in the Brook Valley, on two sites just below the Waterworks Reserve, during the 1890s. Although the mine shafts lie outside the Sanctuary, they are nearby and add to the history of the area. Some of the land on which the Big Dam sits was earlier leased to one of the coal mining ventures in the Valley. Coal was noticed on Nelson’s shoreline by Arthur Wakefield in November 1841 and was known in the Brook Valley at least as early as 1853. Alfred George Jenkins opened a coal prospect on his Enner Glynn property on the southern foot of Jenkins Hill, during 1858. There is record of 200 tons of coal being extracted that year and it was realised that the seam followed the Waimea Fault and was the same seam as that found in the Brook Valley. Jenkins advertised coal for sale up until 1860, but it is not known when his mining activities ceased. In 1875 it was found that the mine at Enner Glynn had fallen in. There was renewed interest in coal in Nelson during 1894 and several citizens who lived in the Brook Valley formed the Brook Street Coal Prospecting Association to prospect a farm owned by James Wilson Newport, on the east side of the Brook stream downstream of the reservoir. 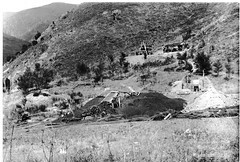 On 11 September that year a drive was started into the hillside on Cummins Spur, 30 feet below older workings. Cummins Creek is the first stream to enter the Brook Stream downstream of the Waterworks Reserve. Several other drives were started nearby but further and further away from the Reserve, but only the first one was continued. A two-and-a-half foot seam was found in this drive but proved to be of limited quantity. The company had difficulty raising further capital and the miners continued without pay but with an agreement to receive any revenue from the sale of coal. The company was wound up on 29 April, 1895. Meanwhile, another prospecting venture, known as the Jenkins Hill Prospecting Association, was launched in October 1894. It was to prospect on the western side of the Brook Stream opposite the reservoir. The property had been formerly owned by Alfred Jenkins but was by then owned by a relative, Alexander O’Brien. A drive commenced on 3 November and found a steeply dipping seam 5 feet thick. By the end of January 1895, the timbered shaft went in 130 feet and 30 tons of coal was stockpiled. By March the drive extended 162 feet but the most profitable seam was located 70 feet in, although it was almost vertical. The coal was of good quality but a horse-drawn whim was required to lift it out. By October 1895, mining consultants estimated that there were up to 4320 tons of coal immediately available and the seam had widened to 13 feet. In December, the Jenkins Hill Prospecting Association was formed into a registered company, the Enner Glynn Coal Mining Company (the Brook Valley name was already taken) in order to raise capital. A new shaft was sunk 60 feet lower and nearer to the Brook Stream. It was taken down to 183 feet and a drive was started from the 160 foot level. Although some coal was extracted, the new shaft was not a success for some time. Eventually, early in 1897, good quality coal was found in workable quantities. However, Nelson residents had formed a poor opinion of the local coal as a consequence of the first deliveries being weathered and of lower quality. The company remained short of capital for development and, to make matters worse, the seam pinched out a short time later. A fire destroyed the coal shed and screen on 15 January 1898, and on 21 June a fire broke out in the mine and it had to be flooded. When the mine was pumped out it was discovered that the main drive had collapsed. On 29 August, an extraordinary meeting of shareholders voted to sell the mine. The mine proved difficult to sell and was eventually purchased by another coal mining interest which did so only to obtain the plant. The Company was wound up in March 1899. The mine had produced 1,337 tons of coal. In 1954 there was some renewed interest in the Jenkins Hill mine, and several short drives were started. “Brook water supply”, an information pamphlet obtained from the Nelson City Council. “Chromite and the Dun Mountain Copper Mining Company”, Johnston, M.R., Journal of the Nelson and Marlborough Historical Society, Vol. 1, No. 3, November 1983, pp4-13. “Coal mining near Nelson City”, Johnston, M.R., Journal of the Nelson Historical Society, Vol. 1, No. 5, October 1985, pp4-18. “Nelson City”, Newport, J.N.W., Journal of the Nelson and Marlborough Historical Society, Vol. 1, No. 3, November 1983, pp14-15. The Colonist, 23 January, 1904; 13 February, 1905; 12 February, 1908; 15 March, 1909. “The Dun Mountain Railway”, Webber, R.M., Journal of the Nelson Historical Society, Vol. 1, No. 1, November 1955, pp12-13. “The Dun Mountain Railway”, Jenkins, J.A., Journal of the Nelson Historical Society, Vol 1, No. 5, December 1961, pp10-12. No. 6, March 1964, pp2-4. The Nelson Evening Mail, 06 December,1900; 15 March, 1909; 27 July, 1934; 29 January, 1937; 25 August, 1938; 2 April, 1947. The Nelson Examiner, 9 May, 1865; 15 May, 1872; 18 May, 1872. The New Zealand Gazette, 16 September, 1865; 12 August, 1878. Walls for water: Pioneer dam building in New Zealand, Offer, R.E., The Dunmore Press, Palmerston North, 1997. See more images from the region's past.